There is a variety of headaches, from minor pain due stress or intense pain from chronic migraines. Here now is a list of the most common kinds of headaches and how to treat them. Caused by medication overuse, such as acetaminophen or ibuprofen. Taking over-the-counter medication more than twice a week and make you susceptible to a withdrawal reaction. Taking caffeine with caffeine increases a risk for a rebound headache. Treatment includes weaning off taking your medication. Those on prescription medication should talk to their doctor before altering their dosage and those taking over-the-counter painkillers can ask their GP about alternative medication options. Caused by stress, anxiety, bad posture, eyestrain, a sinus infection, alcohol, or jaw clenching. Feels like constant aching or pressure on both sides of the head or at the back of the neck. Treatment includes over-the-counter pain relievers, realigning your posture, stretching a tense area, taking vitamin supplements and stress management. Caused by dental-related conditions like bruxism (teeth grinding) and TMJ. Feels like pain behind the eyes, sore jaw muscles, and/or painful scalp. Treatment includes jaw stretching, hot or cold compresses, stress reduction, and bite guards. Caused by alcohol, cigarettes, high altitudes, and food allergies. Feels like one-sided pain usually around the eye. Short-lived (15 minutes to 3 hours) and very painful. Occur most commonly in the middle of the night. 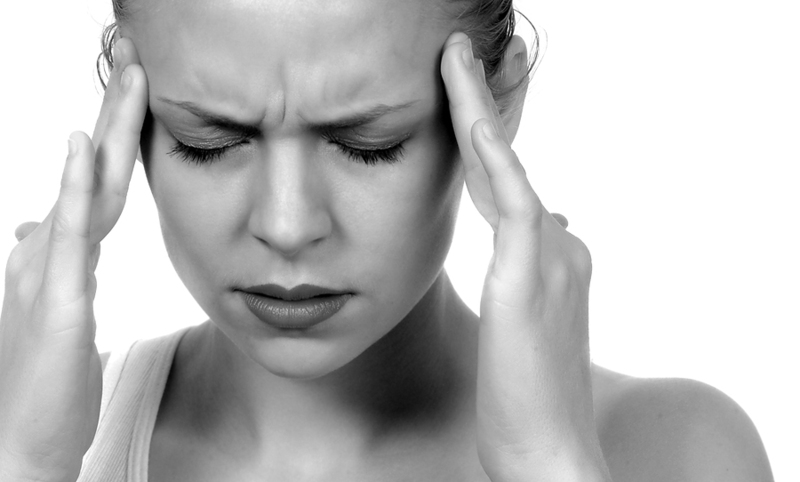 Cluster headaches have a cycle with regular occurrences, even daily, followed by periods without any headaches. Treatment the pain usually ends suddenly. An over the counter pain reliever can be taken. A doctor should be consulted if you have no history of cluster headaches to rule out other disorders. Caused by changing hormones, stress, irregular sleeping or eating patterns. Sometimes migraines are hereditary and chronic. Feels like debilitating head pain that includes sensitivity to light and sound, nausea, vision loss, pins and needles in an arm or leg, difficulty speaking, fainting, disjointed or uncontrolled movements, and confusion. Migraines can last for hours to days. Treatment speak to your doctor about regular medication you can take to lessen the effects of migraines or reduce their frequency. Lifestyle changes, including diet, stress management, and exercise are also encouraged.